I started with red cardstock and folded it for my card base. I then inked all of the edges with Vintage photo Distress Ink and a dauber. My next layer is paper by Echo Park from the Very Merry Christmas collection. I then inked all of the edges of that paper and adhered it to my base. The next layer is the pretty wreath that I cut using the Joys of the Season Cricut cartridge. I cut it out at 5 inches and then inked the edges and added it to my card. I stamped the word Noel on a piece of matching red cardstock and attached it to my wreath. I added a few Doodlebug Designs buttons and some twine from The Twinery. That's all for my cute and simple card. I hope you like it! 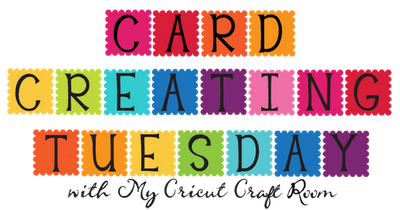 Please be sure to head over to My Cricut Craft Room and see what my design team sisters have made to share with you today! Thanks so much for stopping by! I used the Mini Monsters Cricut cartridge for my Frankenstein. I cut him and his layers out at 4 inches then added stickles and g studio glitter glue. The large die cut shape was cut using the CTMH Art Philosophy cartridge and I used the "Fit to Page" feature and it cut it at 10.5 inches. The fun patterned papers are all by K&Company. 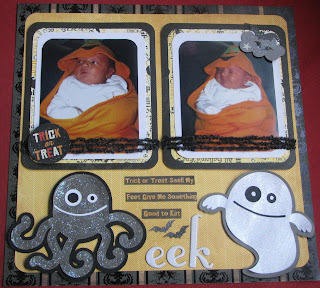 I used punches for the little trick or treat bag and the spider web border strip. 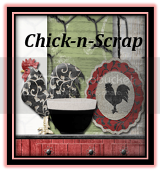 The little bling on the corners of my layout are by Want 2 Scrap. Now I can't wait to take some pictures at the Halloween party we are going to this year! I can't post without mentioning that today is my baby girl's FIRST BIRTHDAY! I can't believe how much she has grown and how fast it has flown by! Here is a picture I took of her napping. Happy Birthday to Ryelynn Grey! Mommy loves you SO very much! Hope you like my layout today! Thank you so much for stopping by! Please be sure to stop by My Cricut Craft Room to see what my design team sisters have made to share! I started with a green glitter DCWV cardstock for the base of my card. I then added a piece of a cute ghost paper from a Halloween stack I got last year. 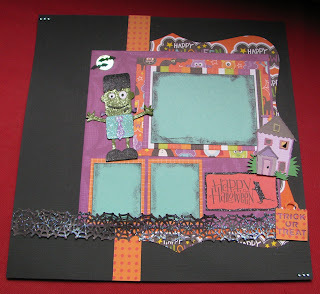 I used the Create a Critter 2 cartridge to cut the cute haunted house and pop dotted it on to my card. I used DCWV glitter cardstock for the yellow layer. See it sparkle? I cut a small piece of the green glitter paper and added the word "boo" with some black letter stickers. Lastly, I wrapped a piece of The Twinery twine in black around my card and tied a bow. Super easy card! I hope you like my little Halloween card for today! Thanks so much for stopping by to visit! Please head over to My Cricut Craft Room to see what my talented design team sisters have made to share! 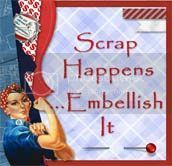 Have a crafty, fun day! 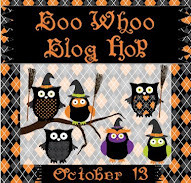 Welcome to the My Cricut Craft Room's Boo Whoo Blog Hop! 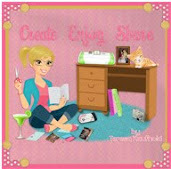 If you just happened to come by to visit please start at the beginning at My Cricut Craft Room. Today we are sharing projects with either a Boo (Halloween) or a Whoo (an owl) or BOTH! We have a fun and fabulous line up today so you won't want to miss a thing! Two lucky people that hops all the way through, leaves comments, and is a follower of My Cricut Craft Room~ will one a Cricut cartridge! 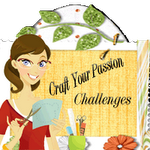 Erica's Craft Room is sponsoring the Teresa Collins Chic & Scary Cricut cartridge and the Pumpkin Carvings Cricut cartridge. How awesome is that?! Here is the 12x12 layout that I made to share with you today. For my little monsters I used the Mini Monsters Cricut cartridge. It is such a cute cartridge. If you don't have it yet you can purchase that HERE. 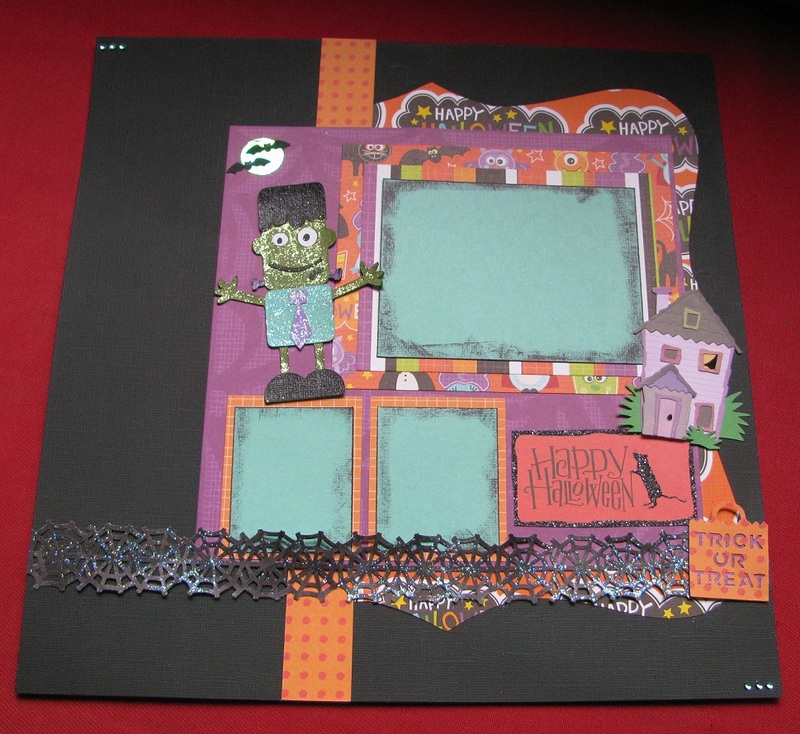 All of the patterned papers are from a DCWV Halloween stack. I used some DCWV glitter paper and lots of star dust stickles on my little layout today. The little trick or treat saying was cut from a patterned paper. The fibers I got from Erica. The other misc. pieces are by K & Company. The photos are of Ryelynn, my daughter that was born on Oct. 26, 2011 so she was just 5 days old on Halloween last year. Boy, does time fly! Here are a couple of more photos of my layout. Then, a while back I went to Goodwill and found this little paper holder thingy for 35 cents. I used the DCWV Halloween papers for this project, too. The owl I cut out at 6 inches from the CTMH Artiste Cricut cartridge. The die cut for the title I cut out at 4 inces and the title letters I cut at 1 inch. (All from Artiste) The other little diecuts are all my K & Company. This was a quick and easy project. I love to find things cheap and make them cuter!! That's my projects for today. I hope you like them! Thanks so much for stopping by and hopping today! We all really appreciate it! Hope you have a fantastic weekend!! Your next stop is the super talented JENN! The brown cardstock was from my stash, the glittered cardstock is by Core'dinations, and the pink paper was in my scrap pile. The digi stamp is by FBD and the link is up above. The pink ribbon I got from my friend, Erica. The little bling was from my stash. The sentiment stamp is a Darcie's stamp. I colored the owl with my Copics. Oh, and I used my first action wobble! So, my little owl "dances"! Thank you for the wobbles, Jessica! That's it...easy peasy! Hope you like my cute little card. I think Gretchen is going to love it! Thank you for stopping by to visit! I hope you have a great Friday...it's only a few minutes away! Hi crafty friends! Hope your week is going well! I've been keeping busy with a fussy baby this week but I finally made it in my craft room for a bit today. I wanted to make a card to enter in a few challenges and here it is. The cardstock and papers are all from my stash. The patterned one is by Pixie Press and I have had it forever! I am glad to finally be using it. :) The stamp is by Fresh Brewed Designs and it's called "Spicy Pumpkin Latte". Isn't she cute? I used Copics to color in the image. The flower was made with 3 Girl JAM crinkle ribbon in "Antique White" and a Bo Bunny gem. The other bling and trim are by Webster's Pages. The stamp is by Recollections. I inked the edges of everything with vintage photo distress ink. Hope you all like my card for today..well, it's tonight now..lol Thanks so much for stopping by to visit! I hope you have a wonderful evening! IMAGINE ation Monday~Let's Hang Out! Good morning, crafty friends. Monday is here once again..I hope you all had a great weekend! 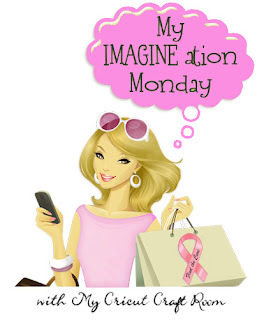 Today is my day to post over at My Cricut Craft Room and it's IMAGINE ation Monday. I used my Cricut Imagine for all of my cards today and I have 3 to share with you! I LOVE my Imagine machine because it really makes fast, cute projects! 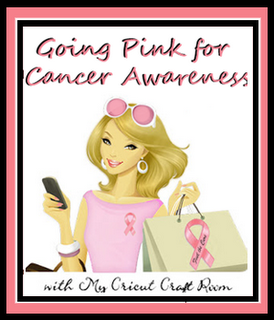 Over at MCCR we are still adding pink to all of our projects for Breast Cancer Awareness Month. I used the Better Together Imagine cartridge for all of my projects today. Here they are..
For my first card, I started with kraft cardstock, then added a piece of woodgrain paper, then another fun little paper from a K & Company stack. I stamped the sentiment on a piece of kraft and pop dotted it it on for added dimension. The owl I cut out at 4 inches and also used pop dots on him. I added a few jewels by Bo Bunny that I bought from Erica and that's it. See the pink on the owl? I added my pink! :) So super fast but I think it's pretty cute. For my second card I started with some green cardstock. (what? no kraft? I know..crazy, huh? lol) Then, I added a little piece of K & Company paper, added on my little owl cut from the Better Together cartridge at 4 inches. I stamped on the sentiment, added some gun metal pearls, and some twine..that's it! So simple! I added a little heart on the back with my initials on it for my pink on this one. Hope you got some kind of inspiration from something you saw here today. Thanks so much for stoppin' by! Hope you have a wonderful, crafty week! Please head over to My Cricut Craft Room and to see more projects like these made by my talented DT sisters! 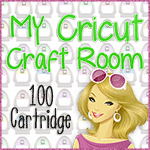 ******If you are looking for the My Cricut Craft Room 100 Cricut Cartridge Blog Hop Click HERE. Happy Sunday, crafty friends! Hope you are enjoying your weekend. I went to a crop yesterday and made 2 projects to enter in a couple of challenges and I wanted to share them with you. Here's what I made..
For this card, I started with kraft cardstock. The patterned papers and paper embellishments are all by Authentique. (My sweet Jessica gave them to me.) The gun metal pearls are by Want 2 Scrap. (Jess gave me those, too.) The crinkle ribbon is by 3 Girl JAM and it's Antique White..so pretty. I used my bow maker by 3 Girl JAM to make that cute little bow. It really makes bow making sooo super easy!! The stamp is by The Crafts Meow. I am going to enter this card into the "Anything Goes Challenge" over at the 3 Girl JAM Challenge Blog. On to my next project.. I started with a little kraft colored gift bag and added some pink polka dotted paper from my scrap pile. the next two layers of papers are by Webster's Pages. I cut a little die cut out with my Slice machine and added the Hoot Hoot sentiment. The little owl is a stamp but I am not sure what brand it is, it was a gift from my other friend Jessica I colored in the flowers on the owl with my Copics and inked the edges with vintage photo distress ink. The little pink ribbon is a punch and the pink fluffy trim is by Webster's Pages. I would like to enter this little bag into the challenge over at the Craft Your Passion Challenge Blog. This week's challenge (ends tonight) is called Save the Hooters. Thanks so much for stopping by to visit me today! Hope you have a wonderful day! 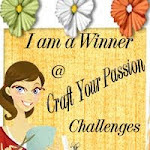 If you stopped by from your dashboard please start here at http://mycricutcraftroom.blogspot.com/ so you don't miss out on any of the fun projects! Collectively the design team uses over 100 different Cricut Cartridges in their projects during the two days of this hop! There is so much talent and inspiration and PRIZES!! Erica is giving away 3 different prizes to 3 separate winners this month! One prize will be TPC Girlfriends pink papers, one will be the Pink Journey Cricut cartridge, and one will be a pink little cricut toy. Oh did I mention, we are going pink for breast cancer awareness this month? For this little gift bag I used the Cars cartridge and cut the peace sign out at 4 inches. The patterned paper is by Amy Tangerine. I used stickers by K & Co and the gray ribbon was in my ribbon stash. For this card I used the Dreams Come True cartridge. I cut the cake out at 4 inches and the patterned papers are by Amy Tangerine. I used a K. Andrew Designs stamp for the sentiment and added some pretty pink twine. For this card, I used the Disney Classics cartridge to cut the pirate ship. I cut the ship out at 4 inches and the monkey is a stamp by Stampendous and so is the sentiment. I hand cut the sun and added stardust stickles, black twine, and some gray gun metal embellies by Want 2 Scrap. I added a pink heart on the back of this card with my initials for my added pink. For this last card I used the Sesame Street Seasons cartridge to cut the pretty snowflake. I inked the edges and used some stickles for some extra sparkle. The patterned papers are the Echo Park Very Merry Christmas collection. I used a border punch for polka dotted strip and added some red twine. The inside of this card says "Joy". The stamps are by Close To My Heart. I also added a pink heart to the back of this card with my initials on it. 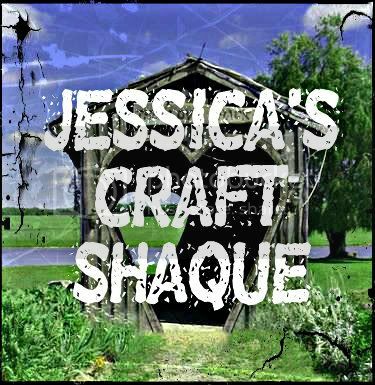 I hope you like my projects today! Thanks so much for coming by and for hopping with us today!! Here's the whole line up in case you get lost along the way! Heather http://heathernovinger.blogspot.com <------- This is ME!! Hello friends! Hope you are having a good week so far! :) Mine's going pretty good..could be worse..could be better! 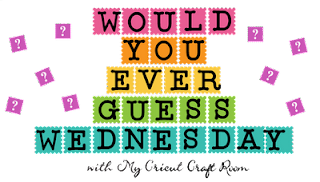 lol Today is my day to post as a My Cricut Craft Room design team member and it's "Theme Day Thursday". The theme for the day is "apples and pumpkins". Over at My Cricut Craft Room we are all..
All of our projects will include pink for a while.That's fine by me because I just happen to love pink! I made a layout to share with you today..Not the traditional colors for Fall but I like the way it turned out..
For my layout I started with pink cardstock. I used the Country Life Cricut cartridge to cut the (yellow) apple tree. I cut it and all of its layers at 4 inches. 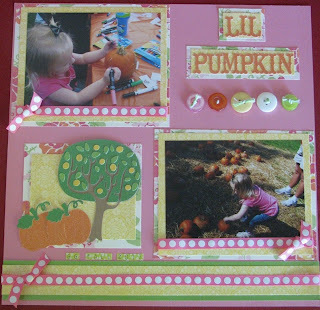 The pumpkins were cut from the Create a Critter 2 cartridge and they were cut at 2 inches. The patterned papers are all from a DCWV Spring stack. I added buttons, twine, and polka dotted ribbon for added embellishments. It's hard to see but the pumpkins and tree are cut from DCWV glitter papers. The title I cut using the Country Life cartridge and I cut the letters out at 1 inch. Here's a couple of more photos. You can click on any of the photos to enlarge. That's my 12 x 12 layout for today. I hope you like it! Thanks so much for stopping by to visit me today! Please be sure to go over to My Cricut Craft Room to see what my talented design team sisters have made to share! Hope you have a great day!